Wyzed is an online training platform that helps streamline multiple aspects of employee management including hiring, onboarding, ongoing training and staff development using fully interactive online training modules that can be accessed anytime via mobile phone, tablet or desktop. Key features include user progress tracking, email and SMS notifications, learner management, automatic training records, and more. To assign training, users can add a learner's phone number or email, and Wyzed will send them a custom link that takes them directly to their training. Users can track learner progress and get insights into the standard and quality of their team, as well as any issues that need to be addressed before they become a problem. Quizzes including custom questions can be incorporated throughout the training. All accounts are cloud based, meaning learners can access their courses anytime and on any device, as well as any forms, files, updates and communications. Wyzed allows users to create any type of training for staff and clients, from a simple system for memos and daily communications, through to fully interactive training modules. Users can edit and add to trainings at anytime, and create new material using combinations of text, images, video, quizzes, online discussions, and interactive apps. Daily communications can include SMS and emails to clients and staff, and memos for updates to policies or training material. Users can manage learners by adding learner details and grouping them into their relevant areas, i.e. sales staff or clients, and enrolling them into their designated training. All employee and client activity is logged and recorded automatically, and completion certificates are emailed to learners, and added to their file. Wyzed also offers the option to sell online courses as an additional revenue stream. There are currently no reviews of Wyzed. Plans are a guide only, and pricing can be tailored more closely to user numbers and training needs. Wyzed helps organizations increase retention rates by providing learners with easy access to the support and services they need. Organizations can present their business professionally with a custom branded training center, as well as a customized URL to match their website. 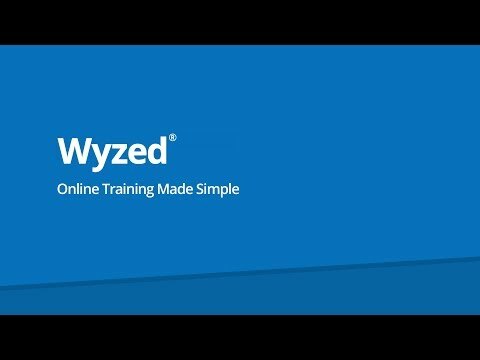 Wyzed automatically tracks and logs all learner activity, allowing users to see at which stage team members and customers are at with their training. Staff and customers can access their training via mobile phone, tablet or desktop at anytime to get help and support whenever they need. Wyzed's trackable memos help keep staff updated on the latest business changes, with automated email and SMS notifications for updates on policies or training material. Below are some frequently asked questions for Wyzed. Q. What type of pricing plans does Wyzed offer? Q. Who are the typical users of Wyzed? Q. What languages does Wyzed support? Q. Does Wyzed support mobile devices? Q. Does Wyzed offer an API? No, Wyzed does not have an API available. Q. What other apps does Wyzed integrate with? Q. What level of support does Wyzed offer?